A UK diplomat has met the Palestinian prime minister - a member of the militant Hamas movement - for talks on a missing BBC journalist. It was the UK's first meeting with Ismail Haniya. The government normally boycotts Hamas as a terrorist group. Alan Johnston went missing on 12 March and is believed to have been kidnapped. Richard Makepeace, UK consul-general in Jerusalem, said the meeting in Gaza was arranged solely to discuss "this very important humanitarian issue". Palestinian Authority President Mahmoud Abbas also met Mr Haniya in Gaza, and faced demonstrations by Palestinian journalists outside his presidential office in Gaza City. "We will not spare any effort to bring back the journalist, the friend, the human being to his family," Mr Abbas said. 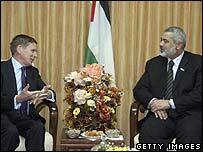 After meeting Mr Haniya, Richard Makepeace stressed that the meeting did not signal a change in UK policy towards Hamas. "I believe all of us want to achieve a peaceful and a quick solution to this unfortunate problem," he told reporters after the meeting. Mr Johnston, the only international correspondent based in Gaza, has been held captive longer than any other journalist there. Britain and the EU usually refuse to meet Hamas members of the new Palestinian national unity government over the Islamic group's refusal to renounce violence and to recognise Israel's right to exist. Western diplomats quoted by Reuters news agency said there had been a general understanding since Hamas came to power in March 2006 that their boycott could be relaxed in emergencies such as kidnappings. The BBC has received thousands of messages of the support from users of the News website demanding the release of Alan Johnston, with names being added to an online petition all the time. Palestinian journalists have also given strong backing for a campaign against perceived inaction by the government in Gaza to secure Mr Johnston's release. BBC representatives have already appealed to Palestinian Authority President Mahmoud Abbas and Mr Haniya. Both have said everything possible is being done to free Mr Johnston. The BBC describes him as a highly experienced and respected reporter. He joined the BBC World Service in 1991 and has spent eight of the last 16 years as a correspondent, including periods in Uzbekistan and Afghanistan.